DUBLIN. On virtually every corner stands a pub offering taps of liquid happiness, pale lager to dark stout, with an overwhelming emphasis on Irish-made offerings. At the forefront stands Guinness, the classic tipple that dominates the stout market both in Ireland and abroad. Tourists flock to Dublin pubs, especially in the Temple Bar area, lapping up pint after pint as thoroughly documented in multitudes of glass-raised-high social media posts. Craft beer enthusiasts do have alternatives to the Guinness hegemony, but finding the gems takes a little effort. Giving myself a 2km walking radius from downtown Dublin (as measured by Google Maps), I set about assembling a personal Top 5 list of craft beer pubs based on a selection character, lineage, and of course beer offerings. As the grandfather of the craft beer scene in Dublin — celebrating 20 years at its Temple Bar location — any list without the Porterhouse would be amiss. Go for the old school Oyster stout (yes, oysters are used in the brewing process) if you want something less common, or their lovely Wrasslers traditional stout which is true to form. For me, the Plain porter was a standout with its creamy soft bitter bite. Sure, venturing into the Temple Bar location means having to dodge the tourists who inundate the district, but it is worth skirting around them to grab a seat at the bar and make your way through the offerings. Another Temple Bar favourite, J.W. Sweetman is notable for brewing its beers onsite, which makes drinking there just as local as one can get! With a cornucopia of cavernous rooms imbued with darkened wood, iron, and brass, J.W. Sweetman emanates an old school atmosphere. The beer offerings are straight forward — a few ales, a Belgian wheat, and a stout — but be sure to check out the cask on tap. Grab an upper-floor level table with a window view of the River Liffey, and pair one of their beers with the traditional Irish stew. You are sure to enjoy yourself. Another example of a brewery-owned pub (or, in this case, multiple pubs with a variety of names), Galway Bay offers its own beers at the forefront but does well in adding a selection of guest taps. The Black Sheep, with its rickety furniture and plentiful board games, could pass as a bohemian university café, making it a relaxing option to kick back and chat with friends. The food menu is also quite impressive. A bit east one finds the Brew Dock offering a similar selection of beers with a bit of a hole-in-the-wall vibe (that my first two choices of beer had both “just run dry” was a disappointment that I will not hold against the location — clearly they were in great demand!). Of Foam and Fury, a double IPA, is a must try for ‘hopheads’ and is revered by many as one of the best beers in Ireland as a whole. If one is going to make a walk out to the periphery of the 2km radius, the choice should be for L. Mulligan Grocer. Heck, make the walk whether you want to or not, as it is a spectacular option for those seeking craft beer in a classic pub feel. A picture perfect bar inundated with old wood and brass, dimly cascading light through the front window, and seats well worn like an old suit, L. Mulligan Grocer is a top choice if you are seeking an old school pub experience with the benefit of craft beer. Particularly admirable was their selection of four White Hag Brewery offerings — one of the most innovative breweries in Ireland. With so much of the Irish craft scene sticking to tried-and-true classics, it is exciting to see a brewery add to its list of standards such offerings as a dry hopped lemon sour and, one of my favourite beers, their oatmeal chocolate milk stout. Kudos to L. Mulligan Grocer for combining great atmosphere with innovative craft beers. On a side note, after I settled up my tab and was about to head out, the bartender put a sample of a beer I had been admiring (but did not try) down in front of me. “I’d hate for you to miss out.” To me, that’s the sign of a pub that really loves great beer and appreciates those who seek it out. Although L. Mulligan Grocer takes top place for traditional pub, when it comes to overall craft beer experience the number one selection has to go to P.Macs. This is not your father’s pub and in many ways is perhaps a bit too raucous or eccentric for those seeking a laid-back Dublin pub experience (at least on weekends). Part pub, par bar, part collection of mismatched furniture and questionable decour, P.Macs is a cool place to be, and the beautiful people know it. My several nights of drinking my way through their beer list took place amidst crowds swaying in a sea of candlelight (P.Macs goes through 140 to 180 candles a day, apparently) and scattered thrift store trophies. Wooden floorboards flexed with life, crumbling Jenga towers hit the tables, and laugher and cheers blended into the Queens of the Stone Age and the Raconteurs. P. Macs is edgy enough to be cool without being pretentious, its authenticity made all the more so by a bar staff that really knows their stuff. The lack of beer snobbery made it all the more worthy. “Look at that table,” the manager pointed out to me. “You have a gin and tonic drinker, a Guinness, a craft pint, a bottle. The biggest mistake craft bars is they forget they are a bar. You have to make it for everyone. We have Heineken, Guinness, but also a 14 percent black triple IPA. 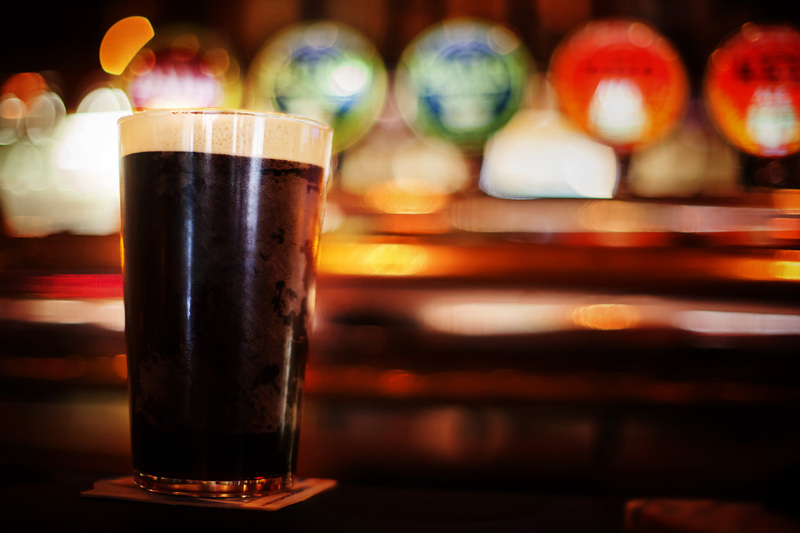 The big ones make the other ones possible.” Pint after pint, my time straddled up to the bar rail at P.Macs was rewarded with great conversation about the Irish beer scene and life in Dublin as a whole. For anyone seeking an eclectic selection of Irish and non-Irish craft beers (that 14 percent black triple IPA, by the way, is the To Øl Black Baal out of Copenhagen, and has a great coffee finish to it) in a downtown upbeat atmosphere, P.Macs is the place to go. Make it your evening destination and then recover the next afternoon at L. Mulligan Grocer. And have a pint (or three) for me. Ryan Edwardson is a photographer, videographer, traveler and author based in Toronto. His specialties are on-site photo shoots in remote locations and portraits of people in their natural environments. Having photographed in over two dozen countries, notable moments include documenting the political struggles in Thailand for Amnesty International, Nobel Peace Prize recipient Aung San Suu Kyi on her election campaign in Burma, being dressed in royal clothing by the Prince of Ubud Bali to photograph a private ceremony, and dragged into a rooster-fighting ring to photograph a victorious Nicaraguan. He is the Researcher on travel television series Departures, Descending, and Over the Horizon, and recently published several photo spreads in Outpost Magazine.